"People are entitled to publish caricatures poking fun at politicians, at anyone else." 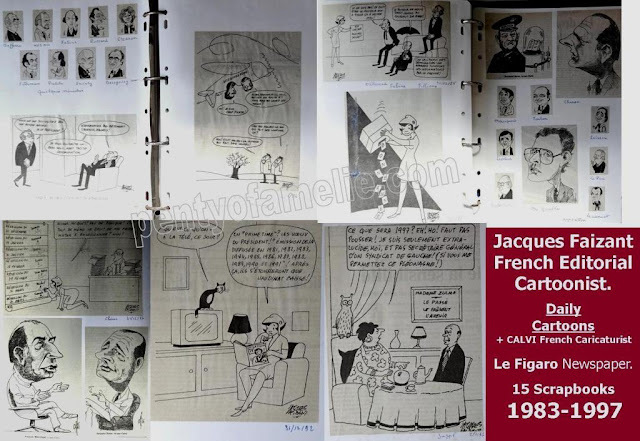 Jacques Faizant (1918-2006) was a French editorial Cartoonist whose work was a fixture in the newspaper Le Figaro for more than four decades. According to Jacques Faizant, his "Marianne" Character stands for "French Republic". She is defined as a Symbol, that is the reason why she does not get old despite years. her role is to "ensure dialogue" between People and successive Presidents in France. History in French Politics. His cat "O Gato" is a clever Philosoph Character. Last, I don't know who owned previously the whole set of 15 scrapbooks For SALE. For sure, he or she Collected Le Figaro Press Clippings, exclusively Jacques Faizant daily cartoons from 1983 until 1997. Each page contents from one up to 2/3 and more media clippings. This is about a great archival work! 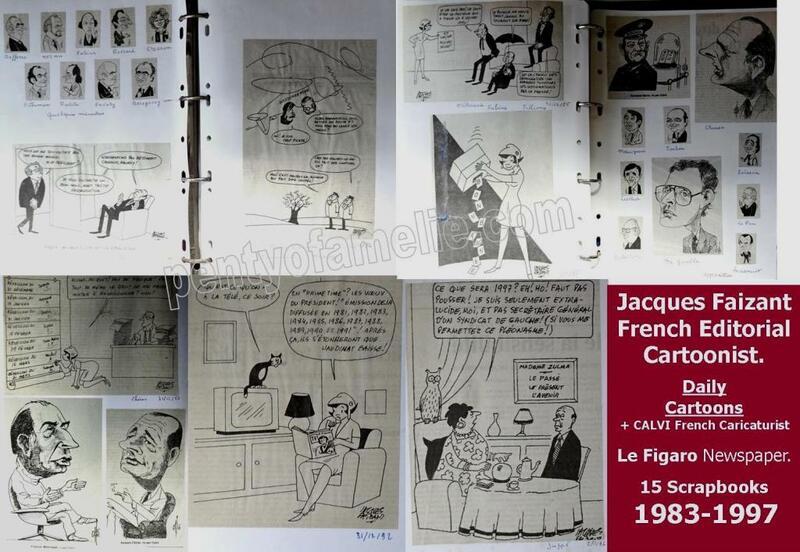 and a full recognition to one of the famous French Cartoonist. Jacques Faisant. 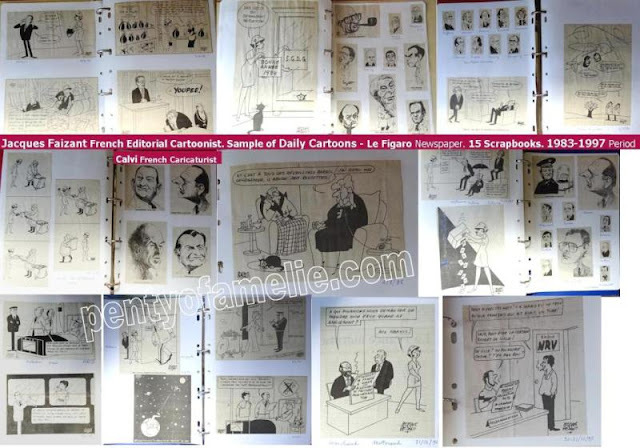 Sample of Daily Cartoons for Le Figaro Newspaper collected in 15 Scrapbooks. 1983-1997 Period. 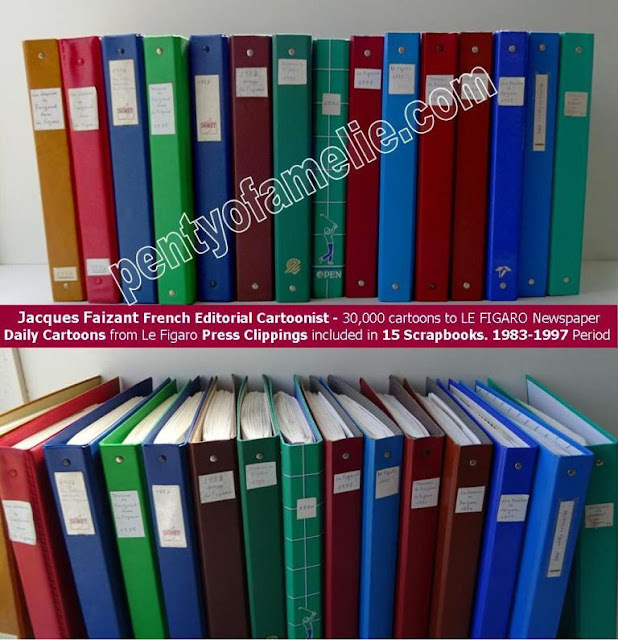 A special gift to all Collectors, also to Francophones and Francophiles everywhere worldwide, Fans of France, speaking fluently French, young/potential Politicians, graduated from ENA, Journalists, etc. and of course to All Fans of Faizant's Drawings.